3.60 руб. 3000 шт. 3-4 недели 3000 шт. 3000 шт. Super Barrier Rectifiers (SBR) diodes are the next generation of rectifiers. 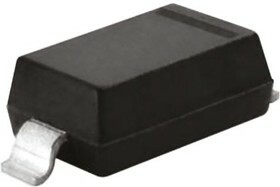 The two terminal device has a lower forward voltage (VF) than comparable Schottky diodes while possessing the thermal stability and high reliability characteristics of PN epitaxial diodes.